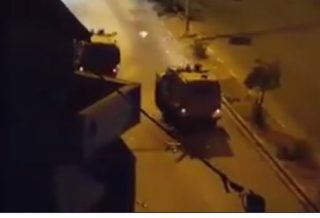 Israeli soldiers invaded, on Saturday at dawn, Hindaza area, east of the West Bank city of Bethlehem, and abducted one Palestinian. The soldiers also broke into and searched several homes in the governorate. The Palestinian Prisoners’ Society (PPS) has reported that the soldiers abducted Mahmoud Sami Obeyyat, 23, after invading his home and searching it, in Hindaza. Dozens of soldiers also invaded the Deheishe refugee camp, south of Bethlehem, and searched several homes, including the homes of Ismael al-Ja’fari and Mohammad Karim al-Atash, in an attempt to abduct the latter but could not locate him. The soldiers also fired many gas bombs and concussion grenades at protesters in the refugee camp.